Can anyone explain the food on the 1911 First Class Lusitania Lunch and Dinner Menus? I found the menus but I have no idea what the food is on the menus. 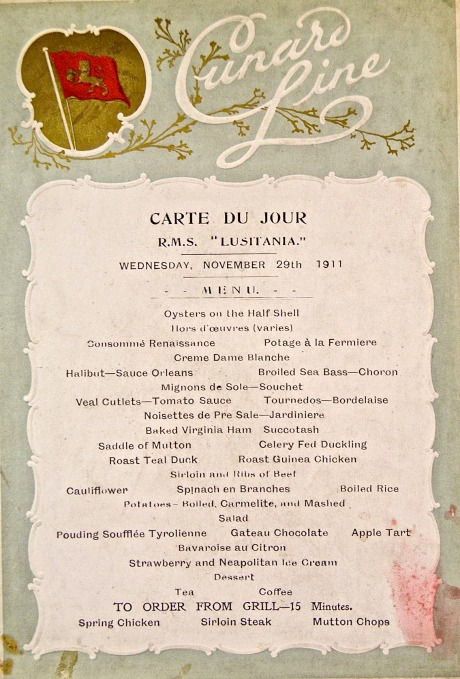 Re: Can anyone explain the food on the 1911 First Class Lusitania Lunch and Dinner Menus? Both menus look very French (St. Germain was the land area of a count I believe), so I would suggest looking at some old French cookbooks or even googling some French cookbooks. They should explain some of the basics to you in addition to having the recipes. For example, a bearnaise sauce is like a hollandaise - a sauce made with vinegar and egg yolks, and anything "en cocotte" means it's cooked in little ramekins, like you would for a creme brulee. Additionally, I would try some recipe sites like Epicurious, Cooks.com. Food Network might even have some for you!